Adorn your Western décor with the silver finished conchos and the Pueblo Indian inspired, hand carved designs of this handcrafted, Santa Fe style bed. The bed has a curved headboard with an exquisite, top crest, and the crest is adorned with five, solid wood, semi-circular designs of varying sizes. The largest semi-circle is in the center, and each is adorned with a silver finished, hand forged, iron concho. Directly below the crest are hand carved, geometric, Pueblo stylized designs. The front of the rectangular headboard is adorned with two, rectangular cut panels, and each panel is embellished with a hand carved, Pueblo Indian inspired, sun design. The panels are divided by a center, solid wood upright. The headboard is framed on its sides with solid wood uprights, and the top of each side upright is accented with an irregular, hand turned sphere. 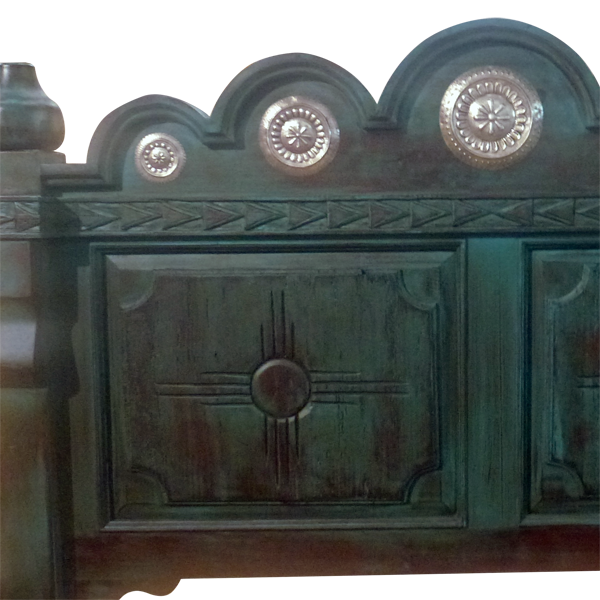 The top of the footboard has a center, top molding, and below the molding are hand carved, geometric, Pueblo style patterns. 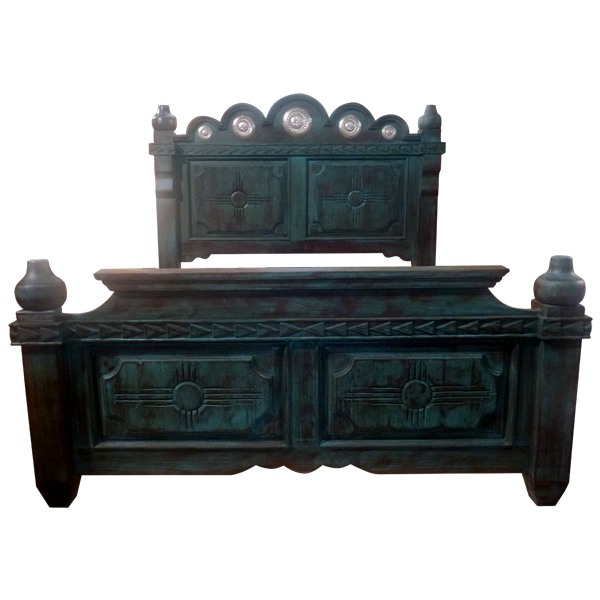 The front of the footboard has two, rectangular cut panels, and each panel is enhanced with a hand carved, Pueblo style, sun design. The panels are separated by a solid wood upright, and directly below the center upright is a curved design. The footboard is framed on each side by robust, solid wood uprights, and each side upright is garnished with a top, hand turned, irregular sphere. The bed has solid wood, side rails, and it rest on slightly sprayed, square cut legs. It has a dark, antique finish, and it is made with the best, sustainable, solid wood available. It is 100% customizable.